My youngest daughter, Bug, loves to shop at Crazy 8! They have all kinds of pretty tops and skirts that you can mix and match with different designed leggings to make a ton of different outfits. They're having a lot of really great sales for the holidays. Today, they're having 50% off all their tops and don't forget to check out their clearance section, it's sweet! One of the things Bug asked for Christmas this year was dresses. She loves to dress up, and when we go to into this store, they have cute little dressing area where Bug has to try on a dozen different outfits even if we tell she can only have one! 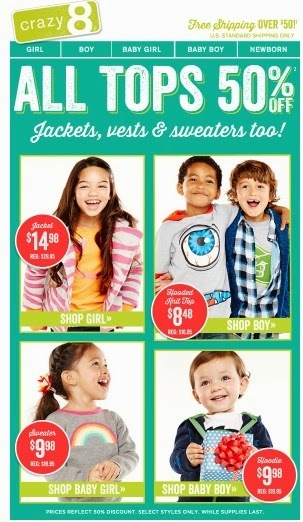 This isn't an affilate link, but if your looking for some great deals on clothes for you little ones, this is the place. I shopped Gymboree and Children's place over the sales days, and Crazy 8 still had the best prices by far when it came to clearance and sales. It's so hard to pick and choose from this place and this store always makes me feel like they're designs are meant to preserve the age of your kid not make them look older and make them more mature when they're not. Do your kids have a favorite store or kind of clothes?